Know an all-star teacher? Nominate your favorite teacher for the All-Star Teacher Contest! | Back to Basics Learning Dynamics, Inc.
Know an all-star teacher? Nominate your favorite teacher for the All-Star Teacher Contest! 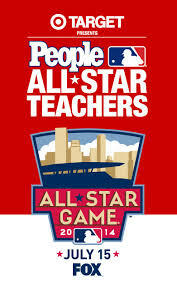 Major League Baseball, PEOPLE, and Target invite you to nominate a current or retired teacher who is a classroom all-star. Someone who has made a difference in the lives of students as well as the community. Thirty teachers will attend and be honored at the 2014 MLB All-Star Game at Target Field in Minnesota. Deadline for entires is May 6, 2014. For more information on the nomination process, visit All-Star Teacher Contest.